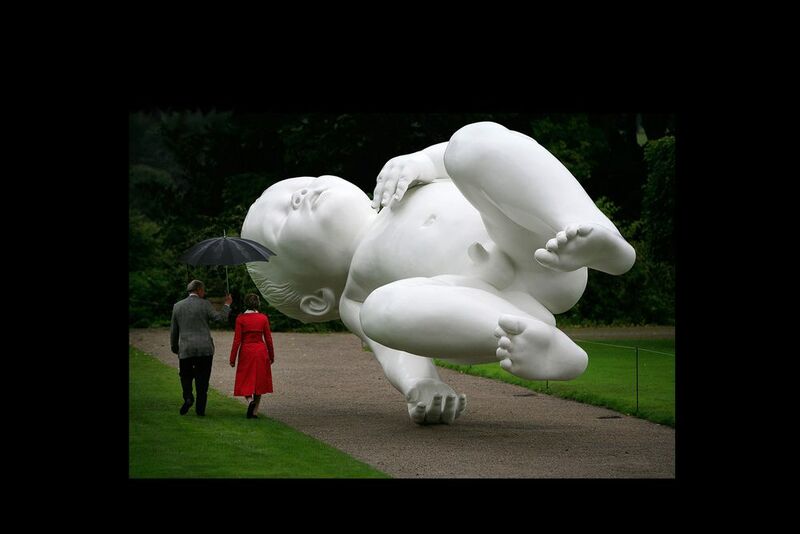 Marc Quinn’s Planet, for the exhibition by Chatsworth and Sotheby’s; Beyond Limits. The sculpture is based on an earlier piece, a real size cast of Quinn’s son. The large bronze sculpture was made by using CNC to cut slices of polystyrene in 2D to be put together to create the full size 3D surface of the Baby. This was used to create the casts for the bronze. Meanwhile, Atelier One designed the internal structure. The baby needed to look as it was balancing effortlessly on the upper side of the hand. The structure needed to be effectively invisible to create this illusion. We used 3D modelling to find the best path through the body down to the hand and designed a steel frame of circular hollow sections to resist the loading through the baby. The main challenge of Planet was the orientation of the baby; large moments were generated at the point where the hand was in contact with the ground as the centre of mass was eccentric from this point. The internal structure also needed to be easily transportable and adjustable as the sculpture was fully assembled in Madrid and transported via vehicles to Chatsworth.